In a few months the station area will be entirely renovated to make way for a new multi-modal interconnection hub. pedestrians will also benefit from a new central plaza open to the city. A new drop-off zone (30 to 35 spaces) on the northern side of the station with 10 minute free parking. A space reserved for taxis from the agglomeration and another, close to the road station for local taxis. An entirely redesigned bus central station with: a largely covered pedestrian walkway giving access to the buses, dynamic vehicle management, display panels indicating the destinations and departure times. Easier, more practical, more modern and friendly, this new multi-mode interchange area will make it possible to connect all means of travel and facilitate all connections: the train is only a step away from the bus! 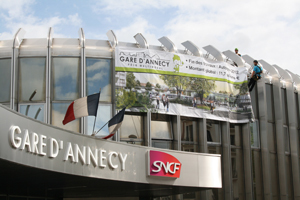 more details on www.agglo-annecy.fr or from the public service facilitator by dialling +33 (0)9 69 32 94 54.